Luxe.Co successfully hosted the “Global Fashion Innovation and Investment Forum” in Gerolamo Theatre, Milan on Tuesday 25 September 2018, with a key theme on “Italian Luxury Brands and Chinese Fashion Consumers.” Alicia Yu, founder and CEO of Luxe.Co, presented the exclusive report “Italian Luxury Brands in China – Luxe.Co Observation 2018” at the forum. This is the first time that Luxe.Co released a research report on China market performance of luxury brands from a particular country. 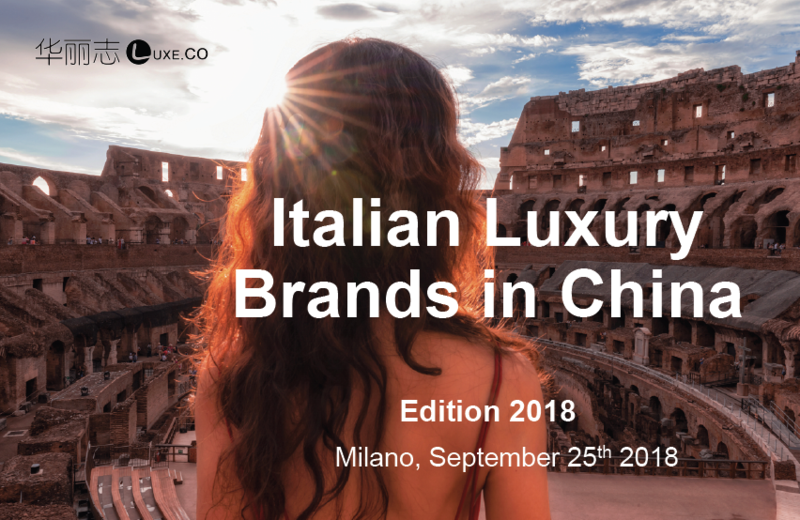 All data comes from public channels and provides readers with a comprehensive view of the business performance of Italian luxury brands in China, unveiling the latest digital marketing initiatives of leading brands, and their interactions with the new generation of Chinese consumers. Of the 50 Italian luxury brands surveyed by Luxe.Co, 40 are from the fashion sector including apparel, leather goods, shoes, jewelry, etc., and 10 are from the lifestyle sector including cars, furniture, food, and fitness equipment. According to the data obtained from the public channel of Luxe.Co, the annual sales of these 50 brands are distributed in three categories: more than 1 billion euros, between 100 million and 1 billion euros, and below 100 million euros. “Every day I find brands that I have never seen before, just by browsing the articles produced by our Italian editorial team , a simple evidence of the depth and width of Italian fashion and luxury industry .” Alicia Yu said. She hopes to increase the number of Italian brands covered to 100 in the next edition of Luxe.Co report , and probably 200 in the future. According to the reports of various authoritative institutions, Chinese consumers have purchased more than 30% of the world’s luxury goods. Overseas travel shopping and online sales have continued to increase in recent years. Meanwhile, offline sales and local retail sales have maintained steady growth. Chinese consumers are embracing “good products” and “good brands” from all over the world with very open mind. The Italian luxury goods industry, of course, has become one of the biggest beneficiaries. The first thing to watch out for is a series of interesting figures about the development of these Italian luxury brands into the Chinese market: 38 of the 50 Italian luxury brands have official Chinese websites, 25 of which make China one of their top five markets, 39 of the 40 luxury fashion brands opened mono-brand stores in China. One of the major challenges for these luxury goods companies in the Chinese market is that they have little support in wholesale business, and they must expand their retail business primarily through mono-brand stores. Italian luxury brands have entered China market long ago. Zegna is one of the first overseas luxury brands to enter China market (1991), followed by Ferragamo (1994), Prada (1995), and Armani (1998). In the beginning, most brands opened their stores in China in five-star hotels in Beijing and Shanghai. Since then, high-end department stores have gradually emerged where the brands can set up shop-in-shops. Recently, many big names are renovating and expanding their stores, primarily focusing on the construction of large flagship stores —— preferably stand-alone facing the street, and of course, many are still inside high-end shopping centers and department stores. Of the 40 Italian luxury fashion brands in mainland China, the average number of stores is 25, with a median of 21; the mean and the median number of stores of the top 20 Italian luxury fashion brands in mainland China are 42 and 38 respectively. In contrast, the top 20 brands of global luxury industry have opened an average of 56 stores in mainland China (see Bain China Luxury Report 2017). The layout of Italian luxury brands in third-party e-commerce channels is also quite extensive. Take the 40 Italian luxury fashion brands as an example: 19 have opened official e-commerce website, 20 have opened Wechat online store (i.e. WeChat mini program). The number of brands existing in mainstream e-commerce platforms such as Tmall, JD, Farfetch, Net-a-porter, and LuisaViaRoma are 11, 18, 31, 23 and 29 respectively. According to a survey of 1,700 Chinese consumers conducted by Luxe.Co, up to 53% of consumers believe that WeChat is their preferred channel for brand information. However, the influence of Weibo, Instagram, magazines, and brand official websites cannot be ignored, accounting for 38%, 26%, 25%, and 24% of the channel respectively. Luxe.Co has conducted detailed statistics on the articles published by the 50 Italian luxury brands’ official Wechat account, including the average number of reads of each article since the account creation, and the average number of reads of each article since 2018. Taking Gucci as an example, its official Wechat account was launched in 2014. The average number of reads of its WeChat articles over the years were 5553 (year2014), 16931 (year2015), 24693 (year2016), 44439 (year2017), and 83028 (year2018). The activity of Gucci’s Wechat account has risen sharply this year, surpassing its French competitors Louis Vuitton and Chanel —— whose number of reads of Wechat articles is 41573 and 41120 respectively in the year 2018. It is worth noting that 46 of the 50 Italian luxury brands covered in the report have official WeChat and Weibo. However, only 22 publish WeChat articles every week, and 21 issue Weibo messages every day. More than half of the brands are not quite active on social media. Italian luxury brands need to put more attention on the Chinese social media platform. Compared with the number of Weibo fans and Instagram fans, an apparent gap can be seen just by looking at the follower base: Gucci has 27.6 million followers on Instagram, while only 1.2 million on Weibo. Prada has 16.5 million followers on Instagram, while only 450,000 on Weibo. The number of Chinese luxury brands’ Chinese follower is still relatively small compared to China’s huge population. There is still much room for Italian brands to grow in the China market. Undoubtedly, luxury brands cannot do without the endorsement of celebrities. The average age of Chinese luxury consumers is much younger than that of European and American countries. The report counts the age distribution of brand spokespersons or ambassadors selected by Italian luxury brands in China: only two of them are over 40 years old. It is surprising that two ambassadors are between 10 and 20 years old. Of course, most brand ambassadors are between the ages of 30 and 40. They are relatively mature and more stable, influencing older or younger consumers. Brand ambassadors aged 20 to 30 also show great potential. Given China’s huge population base, luxury brands tend to choose celebrities with tens of millions of fans. But in fact, there are only a handful of them qualified, and many of them do not necessarily match the image and positioning of the brand, which makes the selection process even more difficult. Before visiting Milan, Luxe.Co conducted a one-week online survey, letting readers speak out their views on “Italian luxury”. 729 valuable feedbacks were collected. 75% of the respondents were under the age of 35, and 75% were iPhone users. Question 1: When it comes to luxury goods, which country do you think first? 60% of respondents chose “Italy,” much higher than France (38%), and even way ahead of the countries ranked third to fifth: UK, Switzerland, and Germany (each accounts for 2% or less). This result surprised many Italians who participated in the Luxe.Co Milan Forum. Most of them have always believed that the Italian luxury goods industry is behind France with respect to brand awareness and influence. This result shows just how heavily “Made in Italy” weighs in the mind of Chinese luxury consumers. Question 2: Which luxury categories do you think Italian brands are superior to other countries’? Question 3: Talk about luxury “Made in Italy”, what is the first word coming to your mind? About 80% of respondents chose “craft”, followed by “history” (60%) , “art” (nearly 50%), and “materials” and “design”. It is worth noting that “status symbol” is least favored, implying that the connotation and quality of Italian luxury well cater to the shifting in the tastes and preferences of Chinese luxury consumers, who are paying more and more attention to product detail and essence rather than the branding power. Question 4: What is your favorite brand? What brand would you recommend to a friend? Although Gucci’s exposure and sales volume have been far ahead of other Italian luxury brands in the past year, Valentino is selected by the largest number of respondents as their favorite brand, with Gucci ranked No.2. 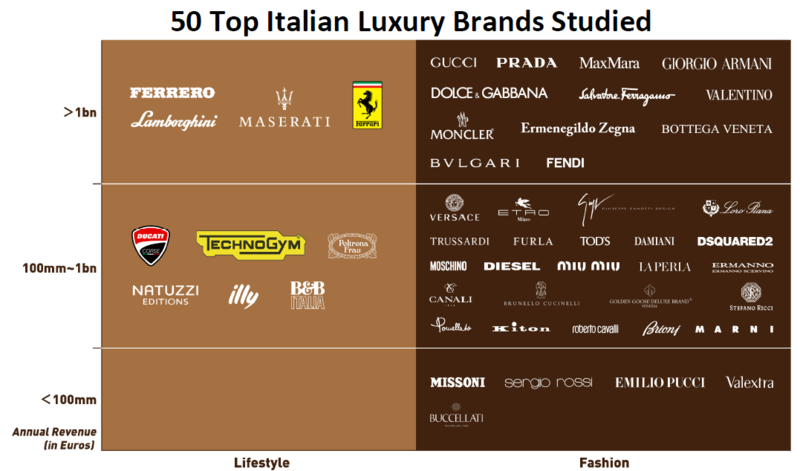 There are also many respondents who prefer relatively niche Italian luxury brands —— among the 50 Italian luxury brands, 20 brands have received recommendation by more than 15% of the respondents , quite a wide distribution of preferences.